Builders have made great strides to make our homes energy efficient. This has resulted in new problems with the quality of the air. We typically spend 12 or more hours a day in our homes resulting in potentially long term exposure to unhealthy air. Some homes have from 2 to 100 times more polluted air than outside. This pollution can cause serious health problems. Dust, smoke, pet dander, mold, mildew, and dust mites are all very common in the typical home. We have researched this problem and found several tips to improve air quality. Fan forced furnaces: If your home is equipped with a fan forced furnace, have the fan running continuously. This will draw air through the filters capturing harmful pollutants. 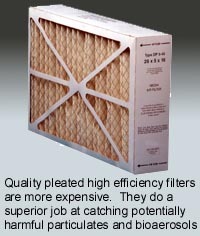 Keep the filters clean, replacing them every 60 to 90 days. High efficiency air filters will capture up to 30 time more pollutants then standard filters. 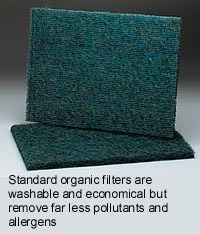 The spun organic/fiberglass filters are the poorest choice, so avoid the reusable washable types. If you do not have a fan forced furnace, you might consider using a portable air cleaner. The units have a huge range in costs and effectiveness, read more about portable air filter from the American Lung Association here. Kitchens: Keep the kitchen vented when cooking, especially if you are cooking with gas appliances. Combustion gases and burning foods can cause serious health problems. All gas cooking appliances require fresh air to properly operate and prevent accumulation of carbon monoxide. Use the exhaust fans and/or keep a kitchen window open while cooking. Wood heating sources: If you have a fireplace or wood stove, it is recommended that a window be kept open slightly to provide adequate combustion air, especially in a newer tightly constructed home. Keep firewood stored outside. Green firewood can release mold spores, which can contaminate your home. It is estimated that 1/3 of all Americans fail to do this making it one of the major contributors to indoor air quality problems. Bioaerosols: Excess moisture in the air can cause bioaerosols to proliferate. Mold, mildew, fungus and dust mites are all organisms that can cause health problems. Reducing the humidity/moisture sources and air handling equipment maintenance are important steps to controlling these problems. Bathrooms: Bathrooms are one common source of moisture, especially showers. 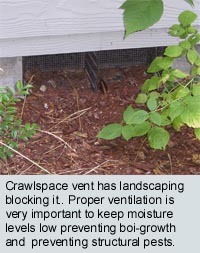 Always use bath exhaust fans if present or open windows to remove excess moisture. Make sure bath fans are vented outside the home and not into attics.